So onto the next part… Blisters… While Rex has good news to share… Landri… not so much. Landri contracted Gingivostomatitis which is totally not awesome at all. Basically it’s sorta like Hand, Foot, & Mouth, but only on the mouth. She had 6 days of fever, and developed some horrific looking (and feeling) blisters all around her mouth. However, even worse than looking like she has a wannabe flesh eating bacteria attacking her sweet face, was the INSIDE of her mouth. Even now, over a week since the ordeal began, and with her external blisters slowly starting to crust and scab up, the blisters inside her mouth seem to be reaching peak awfulness. I legit thought she was growing new teeth, but alas, the large, hard white things that had appeared in the spaces between and behind her teeth were/are in fact pustules containing a greenish snot-like substance that then bleed uncontrollably. It is the grossest and saddest thing I have seen in a while. Of course she has been miserable, exhausted by the fever, in pain from the blisters (hard to eat and drink), and tired of hanging with Mom 24/7 (no gym, summer camp, playdates, park, etc). She also has had a pretty bad attitude about life in general because of this (as I would too, if I were her), which has had me perched on my roof about to jump several times! I hate to be selfish here, but dealing with a toddler all day every day is a tough job, and dealing with a very sick and quarantined toddler all day every day is an even tougher job. Tantrums are magnified beyond belief. Whining and crying about everything is the norm. It’s been terrible. We have finally turned a corner though and I can tell she’s on the mend. We are a long way from being healed (blisters-wise), but I’m guessing that the doctor will give her the all clear on not being contagious today. One thing that I cannot stop thinking about throughout all of this though…. How do parents of chronically, seriously, and/or terminally ill children survive? Again, from a selfish standpoint, how difficult it is to deal with an upset and in pain child, and how difficult it is to watch them suffer and be unable to help? The helplessness has got to be the worst part!! My mind cannot stop thinking about this and I can’t stop thanking God enough for my two healthy babies. A little Gingivostomatitis is nothing. It really is. And to finish off on a high note though, circling back to Beds…Because of Baby Bottle Boot camp’s commencement and my goal to boot Rex to another floor, I need Landri’s crib! So this means that little girl and I got to go to Ikea and pick out a fun bed for her! She was super excited and couldn’t stop talking about “Landri’s bed” all day long. She watched Scott and I put it together and she LOVES it! She slept GREAT on it the last two nights for the first time and a nap. The transition has been smooth thus far – I can’t believe how much she is growing up! PS. 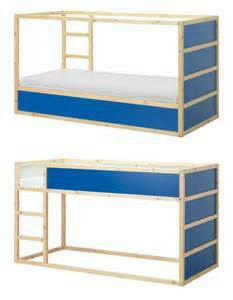 In case you’re interested, we got the reversible twin bunk (Kura) from Ikea. It’s pretty sweet. Of course Landri has it set up to sleep on the bottom right now, but all you have to do is flip it over and she can sleep on the top when she’s older. Ours is white. It’s a neat little bed!